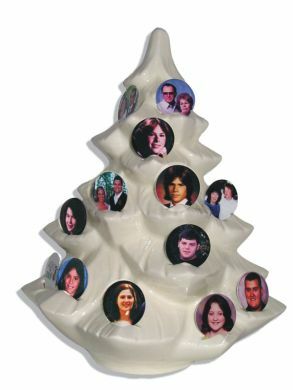 Show off your family pride with this one half Handcrafted Photo Tree. This unique ceramic tree displays your favorite photos embossed individually on 1" round aluminum discs. This handcrafted ceramic hanging wall decor is one-of-a-kind, just like the trees outdoors. Each tree half holds between 13 and 16 interchangable photos. Photo discs can be purchased anytime, so your tree can change with the seasons to create a unique display for holidays, special occasions or school pictures through out the years. See item GFH007-99 to order photo discs. Each photo is secured in the photo slot using hand tack.